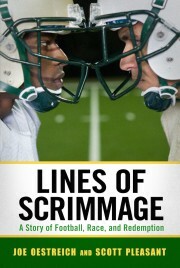 As I type this, the official publication date for LINES OF SCRIMMAGE is ten days away (September 1). Already, however, copies of the book have been showing up in mailboxes. If you pre-ordered your copy at Amazon or elsewhere, expect it to arrive soon. In support of the book, Scott Pleasant and I will be doing a number of readings and presentations. I’ll post the complete list of my appearances in the EVENTS section of this site, but, for now, here are a few places where at least one of us will be reading. All are free and open to the public. Hope to see you there. 9/10/15 – Joe and Scott at Barnes and Noble at the Market Common. Myrtle Beach, SC. 6:30 p.m.
9/29/15 – Scott at the Birmingham Public Library. Birmingham, AL. 6:00 p.m.
9/30/15 – Scott at the Auburn University Library. Auburn, AL. 3:00 p.m.
10/3/15 – Joe at The Ohio State University. Columbus, OH. Denney Hall, Room 311. 3:00 p.m.
10/3/15 – Scott at the Johnson City Public Library. Johnson City, TN. 10:00 a.m.
10/8/15 – Joe and Scott at Coastal Carolina University. Conway, SC. Johnson Auditorium. 7:00 p.m. A panel discussion with a public reception to follow. Previous They’ve Been Going In And Out Of Style. . .